So, on Sunday, I go straight from my 90-minute Spin class to Walmart. Yes, I instruct people on how to pedal a bike, indoors. Thankfully, there is a minimum amount of instruction required. My role as instructor is more like that of Fascist Dictator. I’m kind of like a Spinning Stalin. A Motivating Mussolini. I yell at them and they do what I say. They seem to like it. So, anyway, I go straight to Walmart from Spinning class because I live in the southeast area of Massachusetts, better known as The Land that Time Forgot. Or Land of the Lost, minus the Sleestaks and the zany antics of Will Farrell. The only zany antics we have around here involve second and third cousins. There is nothing near where I live except cranberries. Cranberries and hillbillies. Massachusetts hillbillies. Who’da thunk it? In some circles, this area of Massachusetts is considered to be the Cranberry Capital of the World. Translated, this means, there’s a lot of bogs around here. Bog is the perfect example of onomatopoeia, a word that sounds just like what it is. 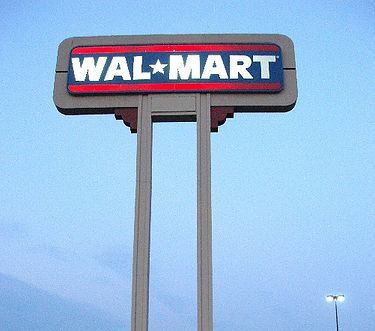 Since I live far, far away from literate civilization I have to go straight to Walmart from the YMCA, otherwise I might end up in one of those long journey kind of predicaments, the kind that require the consumption of familiar human flesh. Needless to say, as I have just spent the last 90 minutes yelling at 20 or so odd people while simultaneously pedaling a stationary bike like Elmira Gulch with Toto in the basket, I am not looking my best. I literally had sweat salt in my hair. My daughter told me about it. She’s so thoughtful that way. So honest and forthright. Sunday afternoon at Walmart is a veritable Who’s Who of the Not Beautiful People. The Beautiful People do not shop at my Walmart. The Beautiful People do not live where I live. The Beautiful People do not know or care who currently holds the title of Cranberry Capital of the World. The Beautiful People think cranberries come from Whole Foods. I went to a Whole Foods once. I was far away home. I was in a beautiful land far, far away from southeastern Massachusetts. There is no Whole Foods where I live. There is no grocery store in my town. What we have instead are Dunkin’ Donuts – roughly 175 of them. Everyone is too jittery to be hungry, so technically we don’t need a grocery store. And if they’re all that hungry, they can always get the breakfast sandwich. No, I was up near Boston, deep in Starbucks country. Whole Foods was not at all like Walmart. I could never go to Whole Foods after Spin class. I’m pretty sure they won’t let you in if you have sweat salt in your hair. I think they have a dress code. And I don’t think the dress code includes pajama bottoms. Pastel pink leggings are definitely out and I’m pretty sure they’d frown on a wife beater. I don’t think you can even say wife and beater in the same sentence at Whole Foods. I think if you did, they might serve you with a restraining order. Everything about Whole Foods was beautiful. The produce, the deli, the bakery. I cannot even talk about the bakery. It is blasphemy to speak of the Whole Foods Bakery. One must take the pilgrimage and pay homage to the bakery as one might travel to the Holy Land or Plymouth Rock. Genuflect before the bakery. There is no other appropriate response. Since I couldn’t afford anything at Whole Foods, I didn’t stay long. I left with a five dollar, 12-ounce bag of flax seed embedded organic tortilla chips. We don’t have flax seed where I live. We have cranberries and hillbilly cousins and fake Coach bags. No fake Coach bags at Whole Foods. And no American cars either. I shop at Walmart because it’s cheap and they have everything I need. Yesterday was the perfect example. I needed bad-for-you food and beer for the Super Bowl. My daughter needed embroidery thread and my son needed a beating. You can beat your children at Walmart and no one bothers you. All those crying babies drown it out. I don’t think you can beat your children at Whole Foods. They’d knock over all that neatly stacked produce. I don’t think children can even go to Whole Foods. I think they card them at the door. The only kids getting carded at Walmart are the ones looking to buy spray paint, or that compressed air computer cleaner stuff. Apparently you have to reach the age of majority before you can vandalize an overpass or huff computer cleaner. I don’t think you can say huff at Whole Foods either. My only fear about shopping at Walmart on a Sunday after Spin class is that I’ll end up on that website: peopleofwalmart.com. I’d much rather be on the peopleofwholefoods website. The people at Whole Foods are so hot they should get together and publish a Whole Foods Swimsuit Calendar. They could pose by the bakery. But, alas, I am not one of the Whole Foods Beautiful People. Maybe someday I’ll reduce my carbon footprint to the point where they’ll accept me. But, for now, I am a Sunday afternoon Walmart shopper. Some people think shopping at Walmart makes you a bad person. Like saving money and living better is somehow akin to gassing the Kurds. I don’t feel like a bad person for shopping at Walmart. And, hey, you can’t beat those prices. I may not be a hot shopper, but, at Walmart on a Sunday afternoon, I can be a smart shopper. I laughed, I cried………I hurled!! Cool. Just don’t lick the stickers they give you at the door. Laughing out loud!! I must send this to Katie in Atlanta..who took me to my first Whole Foods store..and from whom I had to beg for directions to the nearest Walmart because she wouldn’t bring me! Great minds think alike!! I went to Wall Marx for the Super Bowl as well. Grabbed my 30 pack, frozen wings, extension cord, microwave, paper plates and napkins. Had to get there early – before all the pleather recliners were taken in TV/Audio section. They did charge extra to hold my seat while I did some shopping during the halftime show, but it was well worth it! I picked up a dozen 3-Stooges T-shirts for $2! Too true ! I came across the peoplefrom walmart website the other day and it is too funny, so I knowest where you cometh from! I soooo love this one i laughed out loud through the whole thing, so true i too go shopping at walmart on sunday afternoon!! 10 Mark Pollock, the one and only. I’m going to check out peopleofwalmart.com…thanks for the top.